Table of Contents Next: Stark, Harold R.
Library of Congress. Via Wikipedia Commons. Born Josef Vissarionovich Dzhugashvili in Georgia on 21 December 1979, Stalin took his alias as a revolutionary prior to the First World War. He had been expelled from a seminary and was exiled to Siberia for the first time in 1902. He escaped back to Georgia in 1904, where he established his power base. He robbed banks to fund his political activities and may even have been a police informant in 1906. He was routinely underestimated by his political rivals, who considered him a "colorless drone." However, Lenin found him useful, and he was elected to the central Committee in 1912. 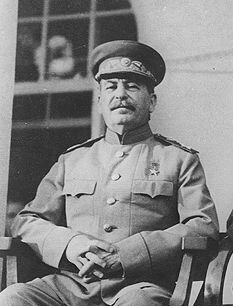 Stalin directed the defense of Tsaritsyn, later renamed Stalingrad, during the Russian Civil War. He launched a political campaign against Trotsky in 1923 and succeeded Lenin in power after the latter's death on 21 January 1924. His first years as Party Secretary were marked by brutal power struggles, but by 1928 Stalin was the absolute dictator of the Soviet Union. Stalin proceeded to force collectivization of farms, liquidating the kulaks (wealthy peasants) and transporting as many as nine million other peasants to Siberia. In 1928 Stalin instituted the first Five Year Plan, which emphasized industrialization at all costs, and agricultural production plummeted at the same time that massive exports of grain were being used to raise foreign capital. The resulting man-made famine of 1933 (the Holodomor) may have killed as many as ten million people. The death by typhus of Stalin's first wife in 1908 was a serious personal blow, and Stalin later wrote that "with her died my last warm feelings for all human beings." The suicide of his second wife in 1932 appears to have triggered Stalin's intense paranoia, which continued throughout the remainder of his life. Although there had been major purges in 1929-1932, the Great Purge of 1936-1938 went to Orwellian extremes, and included the execution of almost all the senior officers of the Red Army. This left Stalin unprepared to face Hitler in 1939, a contributing factor in the Nazi-Soviet Pact of 1939 that allowed Hitler to wage war on Poland, France, and Britain without fear of Soviet intervention. Another Russian motivation for the Pact was the fear of a two-front war with Germany and Japan, which increased following the Battle of Nomonhan and other serious border incidents in Manchuria. Oddly, an element of trust may have been involved: the great Russian writer Alexander Solzhenitsyn claimed that "Not to trust anybody was very typical of Josef Stalin. All the years of his life did he trust one man only, and that was Adolf Hitler"(quoted by Roberts 2011). Stalin signed a non-aggression pact with Japan on 13 April 1941. Less than three months later, Germany launched a massive invasion of Russia (Operation Barbarossa.) Stalin and the Japanese adhered scrupulously to the terms of their nonaggression pact until 5 April 1945, when Stalin denounced the pact. On 9 August 1945, the Soviet Union declared war on Japan and launched a massive invasion of Manchuria. Following victory in the Second World War, Stalin carefully neutralized the great majority of Soviet wartime heroes to prevent their becoming a threat to his power. He also began showing signs of senility, but remained in control until his death on 5 March 1953 from what appeared to be a massive stroke. Speculations persist that he was murdered with rat poison by Beria. Stalin had a phenomenal memory and was a ferocious autodidact. Of him the British ambassador, Averell Harriman, wrote: "... the most inscrutable and contradictory character I have ever known — a baffling man of high intelligence and fantastic grasp of detail.... better informed than Roosevelt, more realistic than Churchill, and in some ways the most effective of the war leaders. At the same time he was, of course a murderous tyrant." Harry Hopkins, Roosevelt's closest advisor, said of Stalin that "He does not repeat himself. There is no waste of word, gesture, or mannerism.... He's built close to the ground, like a football coach's dream of a tackle. His hands are huge, as hard as his mind. His voice is harsh, but ever under control. What he says is all the accent and inflection his words need" (Smith 2007). Stalin had escaped military service in his youth because of paralysis of his left arm, and he had prominent scars from smallpox that were carefully retouched out of official portraits.